In June 2017 the Pushkin Museum of Fine Arts exhibited works by Titian, Tintoretto and Veronese that are rarely shown outside Italy. One year later, a new project between the Russian museum and the Museo Civico di Palazzo Chiericati in Vicenza, north of Venice, brings to Moscow artworks of eminent Venetian masters of 18th Century. “From Tiepolo to Canaletto and Guardi” exhibits 57 artworks: 23 pieces from Museo Civico di Palazzo Chiericati, 25 from the Pushkin State Museum of Fine Arts, and nine from Gallerie d’Italia, Palazzo Leoni Montanari. This is the first time they have ever been shown together, enabling the visitors to see the full range of Venetian rococo painting. The combination of artworks from three different collections offers a unique opportunity for visitors to discover new masterpieces and, most important, get a more complete picture of the diversity of 18th-century Venetian art. 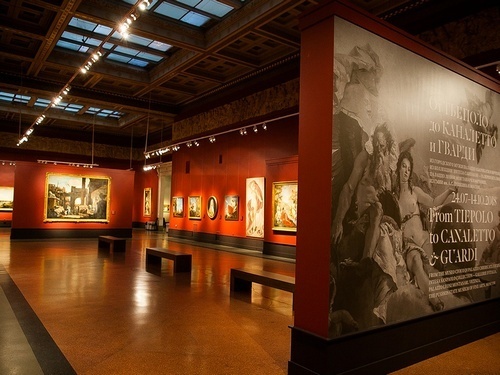 Although the Pushkin Museum houses a rich selection of Italian painting, in which the school of Venice is well represented, Russian art lovers can see works by two remarkable Venetian artists of the period, Giambattista Piazzetta and Pietro Longhi, who are rarely found in Russian collections. Meanwhile, works by Canaletto, Bernardo Bellotto, and other masters are quite rare in Vicenza’s collections. “The collections of the two museums are complementary. By putting them together, we managed to connect perfectly a century that was the last golden age for Italy’s leading artistic role in Europe,” Giovanni Villa told The Moscow Times. The director emeritus of Vicenza’s Civic Museums and curator from the Italian side described how the art project encapsulated a century and how the three artists — Tiepolo, Canaletto and Guardi — unified European culture with their style. In the vast museum hall the exhibition opens with pieces by artists active in the 17th and early 18th century: Jacob van de Kerckhoven — known in Italy as Giacomo da Castello; Jacobus Victor; and Elisabetta Marchioni — masters of still lifes. Their works were widely popular in Venice, where local artists did not seem to have any interest in still lifes and considered them a lower genre. At the time painters preferred religious and mythological subject matters, seeing them as more noble. Together with them are the works of Sebastiano Ricci, a painter who exerted considerable influence on the stylistic formation of rococo in Europe and who was the first artist to bring international acclaim to Venetian painting. The 1730s and 1750s are represented by major religious works by Giambattista Piazzetta and Giambattista Tiepolo: “The Ecstasy of Saint Francis” by the former and “Immaculate Conception” by the latter. Tiepolo’s work is in many ways in opposition to Piazzetta’s fantasies, and it departs from baroque drama and introduces vivid colors. Next to them are the painters who portrayed a new type of cityscape: among them, Antonio Canaletto, who captured the unique atmosphere and feel of Venice including its day-to-day life and celebrations. But he is joined by Francesco Guardi, who saw the city of Venice differently. His goal was to create poetic and picturesque fantasies that combined reality and fiction. The idea of how to portray the century is seen in Canaletto’s “Bucentaur’s Return to the Pier by the Palazzo Ducale” and “The Charlatan” by Pietro Falca (called Longhi), which shows multiple sides of Venice — its beauty and its vices. After Moscow, the exhibition, which was funded in part by the Italian Embassy in Moscow, will travel to Vicenza to let Italian visitors be charmed by paintings from the Pushkin Museum — and to strengthen the cultural ties between Italy and Russia.